PGT Winguard windows and doors were the first High-Impact Hurricane Rated windows and doors available for homeowners in Florida. Made in Florida, PGT Industries is located in Sarasota County, Florida and currently employs more residents in Sarasota County than any other employer. Using quality materials such as 100% virgin vinyl, PVB and SGP hurricane glass interlayers, patented warm edge spacing system, 3-point locking mechanisms, stainless steel hardware, and more, PGT windows and doors are guaranteed to withstand the severe weather we face year round. Hurricane Windows & Doors has become one of Florida’s largest PGT Winguard installation companies, installing PGT Winguard windows in single-family homes, condominiums, and high-rise buildings throughout the Gulf Coast. With unbeatable prices and an unparalleled level of customer service, Hurricane Windows & Doors is the #1 source for PGT Winguard windows, doors, and sliding glass doors. View all of the offerings from PGT below and call us 24/7 727-789-2900 for a Free Estimate and discover the Difference! *ALL-NEW* PGT 5500 Series Vinyl Winguard Windows meet Miami-Dade County High Velocity Hurricane Zone (HVHZ) Building Codes. This also means they will be up to building code anywhere in the United States. As the original residential impact window, the Winguard has never had a single recorded failure during a natural disaster. The newly designed Winguard Series has improved even more, featuring PGT’s exclusive new “Snap-Lock” automatic locks, Tilt-Latch Secure Connect Technology, Aluminum Interlock built-in to the sashes, PGT Comfort Lift Handles, wood grain color options as well as new interior and exterior colors, and more! Call us for more information about the options available for the NEW Winguard, including the Energy Performance Package, Coastal Package, and the Safe & Secure Package which provides additional safety mechanisms. The PGT Winguard is the most popular residential replacement impact resistant window in the Tampa, Sarasota, Manatee, and Pinellas County market. PGT 700 Series Aluminum Winguard Windows meet Miami-Dade County High Velocity Hurricane Zone (HVHZ) Building Codes. This also means they will be up to building code anywhere in the United States. As the original residential impact window, the Winguard has never had a single recorded failure during a natural disaster. 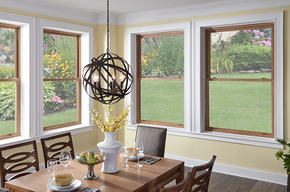 This is one of the most popular aluminum replacement impact windows available. PGT 570 Series Sliding Glass Doors: The PGT Winguard 570 Series features a High-Impact Hurricane Rating by incorporating laminated storm resistant glass. Both feature insulated double pane glass, low-e, and argon gas for maximum energy efficiency that meets the most stringent Energy Star demands. A glass makeup that features an interlayer sandwiched between two pieces of glass to create a virtually impenetrable barrier. A third piece of glass offers enhanced insulation, further reducing your energy costs. PGT’s SecureConnect Technology integrates proprietary designed corner keys into the sash of each window. This design system ensures the integrity and performance of every window no matter how large or small. PGT sliding glass doors include their Mortise Dual-Point locking mechanism standard on every door. This locking system provides added security for your home by restricting panels from being lifted off the tracks. PGT’s ComfortLift handle provides fingertip operation when opening or closing the windows. PGT’s TrueHold hinge ensures that your casement window, no matter how large, will maintain its smooth, effortless operation for years to come. An integrated aluminum design feature that provides added strength and allows for larger sizes with higher design pressures. Just shut the window and PGT’s SnapLock automatically locks into place with its 3-point locking mechanism.